Carol Forbes gave one final glance at her cafeteria staff at St. Aloysius School in Baton Rouge, bracing for what would soon be growling young stomachs ready to pounce on their lunch offering. Catholic Schools Office superintendent Dr. Melanie Verges, left, and Bishop Michael G. Duca join Father Randy Cuevas, right, pastor of St. Aloysius Church in Baton Rouge, and Erin Candilora, principal of St. Aloysius School, to serve lunch to students. Federal, state and local officials toured Catholic schools in the Diocese of Baton Rouge March 18 – 22. “Here they come!” Forbes said as she gazed at the double doors, where the sounds of kindergarten voices yelped their anticipation. Within seconds, dozens of energetic young students bounded into the lunchroom, filling the air with chatter and laughter of kids using their outside voices inside. Behind the serving line, Bishop Michael G. Duca joined Catholic schools superintendent Dr. Melanie Verges, St. Aloysius principal Erin Candilora and pastor Father Randy Cuevas, loading up trays with fruits, vegetables and a cupcake. March is Child Nutrition Month and Lynda Carville, director of child nutrition for the Diocese of Baton Rouge, uses the time to let lawmakers and policy makers understand the importance of funding school lunch programs. 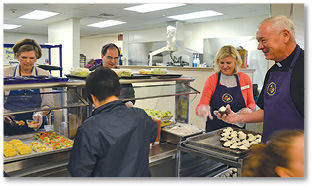 From March 18 – March 26, local officials, state and federal lawmakers and USDA representatives made lunch stops at Catholic school cafeterias throughout the diocese. “We serve nine different (civil) parishes – it’s a lot,” said Carville. “But we want to let them know we do a lot of cooking from scratch and we want them to see how the actual system works. According to Carville, child nutrition directors across the U.S. battle two areas: funding and flexibility on guidelines on what must be served, including calorie count, sodium intake and serving sizes. 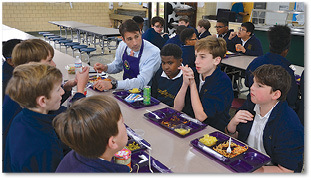 Rep. Garret Graves (R-LA) talks with students at Sacred Heart of Jesus School in Baton Rouge on March 18 during his visit to the school to learn about the school lunch program in the Diocese of Baton Rouge. “We’re seeing a lot of waste and that’s the biggest thing because we have to serve a half a cup and they have to take a fruit or a vegetable and some children don’t want that. And, some people can’t eat a half a cup of fruit and so a lot of it goes into the trash and so we’re trying to minimize that from happening,” she said. Rep. Garret Graves (R-LA) joined workers at Sacred Heart of Jesus School in Baton Rouge in the service line, then sat for lunch with students and a visit with child nutrition staffers to learn more about the challenges in creating healthy menus, including requirements of whole grain-rich foods. “It’s an opportunity for children, who may not want to finish their entire meal, to take some of the items, for example an orange or an apple, and place it on the share table for other children who may want to partake of that item,” said Longoria. New rules from the USDA that allow more flexibility on flavored milk options, sodium standards and whole grains go into effect July 1.